Ever since the advent of the web, digital advertising has only grown with no end in sight. And it’s not just a game for giants like Coca-Cola and Wal-Mart. We can get you in on the action (and ROI) of digital advertising so more customers are seeing you on the screen and not just on the streets. A pay-per-click (PPC) ad is any digital ad where the business is charged each time a user clicks on it. This is the oldest and most common type of advertising on the web. You can see pay-per-click ads on social media, Google, and on websites (referred to as “banner ads”). We can design an ad for your product, place it on a website and, when clicked, it sends the user to your website. And you can customize all of it: from where to advertise to how much you’re willing to spend to what type of person you want to show it to. Once your max budget is reached, your ad is removed. Easy as that. Google Ads (formerly Adwords) is the platform that lets you advertise directly on Google’s search results pages. 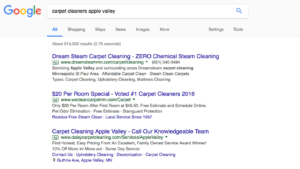 This works the same as pay-per-click (set a budget and pay each time someone clicks), but your “ad” is a title and description in the format of Google search results. Advertising on Google has a huge benefit: users only go to Google if they’re searching for something. If you give them what they’re searching for, they click, you pay, and they are taken to your website instead of your competitor’s. Advertising on social media sites like Facebook, Twitter, YouTube, LinkedIn, or Instagram (and really any social media site) is generally affordable, effective and can show a big return if done correctly. The same rules of pay-per-click apply, and sites like Facebook have pretty sophisticated ways of targeting users who are both interested in your product and likely to make a purchase. Our social media strategists can get your product in front of potential customers by targeting toward your specific demographic (women over 30 in Minneapolis; men, 18-45, interested in lawn care; etc.). An influencer is someone who shows off a skill, opinion or advice, usually via social media. Businesses can pay these influencers (who can have thousands or millions of followers) to show off and talk about a product. Won’t break the bank – Unlike celebrity traditional endorsements (which can put millions of your dollars in their pockets), social media influencers have a much smaller price tag. Direct interest – The followers of these influencers watch them because they are interested in their topics, so products are more relatable. Viewers also find more trust in influencers who are prominent in their craft rather than celebrities in TV commercials who have little to do with the endorsed product (cue Tom Hanks holding a hotdog). Immediate purchasing – Influencers can include a direct link to your product page from the site the video is playing on. You can also include a promotional code to track how many customers come from that video. Yes, direct mail is alive and well. The Direct Marketing Association has even found the response rate of direct mail can be 10 to 30 times higher than digital marketing. Combine that response rate with the reach you can achieve in the digital realm, and you’re talking big numbers. We offer a program that combines direct mail and digital marketing to reach customers wherever they go. A mail piece is sent to their mailbox. That mail piece has a URL and a call-to-action, urging customers to visit your website. The customer goes to your webpage to take action. 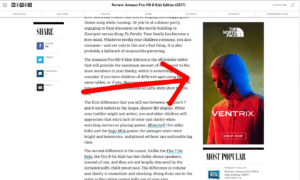 If they leave the webpage without taking action, they are shown non-intrusive ads as they surf the web reminding them of your product or service. If they click those ads, they head back to your site to see your products again. The United States Postal Service came out with Informed Delivery to boost interaction between mail and the web. Residents sign up to receive black-and-white preview images in their email of their direct mail hours before it’s delivered (great for security and travel plans). Businesses send mailers, then create full-color, clickable ads to replace the black-and-white images in the customer’s email. 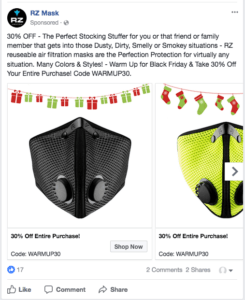 The customer can then click the image and go directly to the business’s webpage to view products or services, even before the mail hits their mailbox. Currently, 2 million people are signed up for Informed Delivery, and thousands more sign up every day. The service is also free for businesses (for the time being), so now is a good time to jump on the opportunity. Why Choose Creative Graphics To Handle Your PPC?